I refill my own gas canisters. This procedure is not recommended by any manufacturer. There may also be certain legal sanctions against refilled canisters. I'm not a lawyer, but my understanding is that in the US refilled canisters may not be transported across state lines and that refilled canisters may not be sold. UPDATE 26 March 2017: There is a another method of canister refilling, a method using the G-Works Gas Saver. The G-Works Gas Saver is cheaper and easier to use than the adapter I used in the below post. The G-Works Gas Saver is also better in that it does not use 100% butane (which is only good for warmer weather). Please see: The G-Works R1 Gas Saver – Refilling Backpacking Canisters II. There are certain dangers that go along with using gas, even if you're using your stove in exactly the manner prescribed by the manufacturer. Gas is flammable. Gas can explode. Know and understand the dangers before working with gas. Overfilling. If you fill a gas canister beyond it's stated capacity, the internal pressure may cause the canister to leak, burst, or explode. Gas leaks. Gas may escape during refilling with or without equipment failures or malfunctions. Such gas could ignite or explode. Leaking gas can also be very very cold, and cold injuries could result. Damage to valve or threads. The valve or threads could become damaged or worn during refilling. No problem may occur during the refilling itself, but the damaged threads or valve could be hazardous later on. Refilling with gases with too high a vapor pressure. Canisters come with a specific mix of gases. If one were to refill with different gases or a different mix of the same gases, the vapor pressure of the resultant mix might exceed the strength of the canister. Do NOT fill backpacking type canisters with 100% propane under any circumstances. Clearly, there are dangers to canister refilling. If you choose to refill gas canisters, you are making a decision to engage in a practice that you know to be dangerous. If you of your own free will choose to engage in a practice that you know to be dangerous, don't blame me or anyone else for your choices. That said, I will describe how I refill canisters. I will also describe what steps I take to partially mitigate the dangers of refilling, but understand that no matter how safe your procedures are, refilling gas canisters is by its very nature dangerous. You might be able to somewhat reduce the danger, but refilling is dangerous no matter what. Step one is of course to get an empty canister. Today, I'm going to refill a Coleman brand standard threaded 220g canister. The newer orange label Coleman canisters do not work with many brands of stoves. The older green label Coleman canisters seem to work fine. A Coleman brand 220g standard threaded gas canister. The first step in refilling is to weigh the canister. Why weigh the canister? I weigh the canister to establish a maxium full weight. You do NOT want to overfill the canister. The best practice is to weigh the full canister when you first bring it home from the store. The weight of the full canister when you bring it home from the store should be considered the maximum full weight. What if I forgot to weigh the canister when it was new? Well, if you weigh the canister when it is empty and then add the capacity of the canister, in this case 220g, then you should also be able to determine the maximum full weight of the canister. The empty weight of a Coleman brand 220g canister is 143g. The capacity is 220g. Therefore, the maximum full weight is 363g. Do NOT exceed the maximum full weight when you refill. If you exceed this weight, the pressure inside the canister may exceed the strength of the canister. If the canister leaks, bursts, or explodes, very serious injuries could result. Do NOT exceed the maximum full weight of the canister. Next, I mark the weights on the canister. I tend to lose slips of paper, so I mark the canister itself. The empty and full weights, marked directly on the canister. Next, I mark the canister as refilled by writing an "R" on the bottom of the canister. I then put a hash mark next to the "R" every time I refill the canister. One hash mark indicates one refill, two hash marks indicates two refills, and so on. An "R" on the bottom of the canister indicates that the canister has been refilled. Hash marks indicate the number of refills. This canister has been refilled one time. Eventually the valve may become weakened with use. After I've refilled a canister 12 times, I take the canister to the recycling center. Twelve is an arbitrary number, but it is a relatively low number. So far twelve has been a safe number. I visually inspect the canister and threads/valve before refilling. If it looks bad, it is bad, and it goes in the recycle bin. Now, after all that, I take out my refiller. A refiller for standard threaded gas canisters. I bought this refiller via eBay seller world_wide_2009 who apparently is in Japan. I believe I paid $37.00 USD for the refiller. I've had the refiller for at least two years. With this somewhat expensive but high quality refiller, I feel like there is a) a reduced risk of damaging the threads or valve on a receiving canister, and b) very little gas leaks -- about the same amount as would normally leak when hooking up or unhooking a stove. Very little in other words. I've seen lots of scary looking homemade rigs of questionable quality. I personally would rather pay the extra money and do it right. The instructions that came with the refiller were in Japanese but did include helpful pictograms. Notice that I have the weight written on the refiller itself (88g). While I'm in the process of refilling, I can weigh the canister without removing the refiller. I just subtract 88g from the weight displayed on the scale in order to know the weight of the canister I'm in the process of refilling. Note in the above photo that the connector shown attaches to a standard threaded backpacking type canister. What does the other side connect to? This side of the refiller connects to 100% butane canisters. 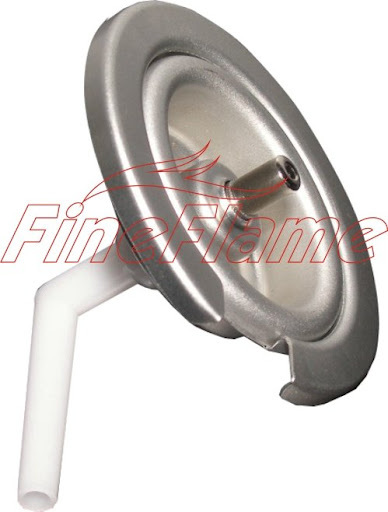 The opposite side of the refiller connects to the inexpensive 100% butane canisters of the type used in the restaurant industry. Why butane? Well, first butane is cheap. If you're going to do your own refills, then you'd better have a source of gas cheaper than backpacking canisters. If your refill gas isn't cheaper, why would you refill? You'd just go buy the regular backpacking gas. In my area, 227g of butane is $1.25 USD. Backpacking canisters are about $5.00 for 110g or $6.00 for 220g. 100% butane is far cheaper. Personally, I use 110g canisters more than any other size. With refilling, I'm in effect paying $0.63 per 110g canister. If you saw perfectly good 110g canisters on sale for $0.63, wouldn't you pick a few up? I bet most people would. My canisters are always on sale for $0.63. I never hesitate to take out the gas stove whether on a day hike or a backpacking trip. You want another cup of coffee? Sure! Why not? How about two? I rather like having an abundant source of cheap gas. YMMV. Each to his or her own. Second, butane is relatively safe. Pick up one of those little clear plastic cigarette lighters some time. Hold it up to the light. That clear liquid you see in there is butane. Of the gases commonly used for backpacking canisters, butane has the lowest vapor pressure. If that little cheap plastic lighter can hold the pressure of butane, your steel backpacking canister certainly can. No matter what mix originally came in your backpacking canister, butane will have a lower vapor pressure. Butane is pretty safe to use for refilling. Do NOT fill backpacking type canisters with 100% propane under any circumstances. The next step in refilling is to hook everything up. First I screw the refiller onto the receiving canister. Next, I hook up the donating butane canister. The larger hook on the connector clips onto the collar on the butane canister. The collar on the butane canister clips on to the larger of the two hooks on the connector of the refiller. The smaller of the two hooks on the refiller's connector slips through the notch on the collar of the butane canister. The smaller of the two hooks on the refiller goes through the notch on the butane canister's collar. The canister is then rotated to the right approximately 1/16th of a turn, locking the canister into the connector on the refiller. The butane canister turns to the right and locks in place. A refiller all hooked up and ready to transfer fuel. Now, simply open the valve, and gravity will do the work for you. The liquid butane in the donor canister will flow into the receiving canister. Recall though that there is one complication: There is a vapor feed tube inside the canister. There is a plastic vapor feed tube inside the butane canister. That tube aligns with the notch in the collar of the butane canister. For maximum transfer, you want to tilt the canister at a bit of an angle with the notch on the collar of the butane canister pointing down. Prop the canister at a steep angle as shown with the notch pointing down. The transfer is very slow. Normally, I set it up and then go about my business. I check it after a couple of hours. The vapor feed tube appears to vary slightly brand to brand. As a purely practical matter, MegaOne gas seems to be the easiest brand to transfer gas from. GasOne is a bit more tricky. Sometimes I've had to chill the receiving canister and warm the donating canister to get it to work right. Each canister brand has a "sweet spot," that is an angle where the transfer works best. You'll just have to experiment with that. I've tried three different brands of butane thus far. I've always been able to get it to work although some brands require more fiddling than others. Since I'm writing a blog post, I don't want to wait a couple of hours for my results, so I'll just detach the refiller now and weigh it after only a few minutes. Recall that our receiving canister weighed 143g when empty. Not the world's clearest photo, but the canister now weighs 184g, a gain of 41g in just a few minutes. I notice that there's typically a rush of gas when I first open the valve, and then a very very slow bubbling after that. I can only hear the slow bubbling if I physically press my ear up to the donating canister. When using a slow gravity feed like this, I haven't had a lot of problems with overfilling, but remember to periodically check the canister, especially with the small 100g class canisters. When filling a 220g canister from a 227g canister, there is no worry of any significant overfilling. I often leave 220g canisters hooked up overnight and simply unhook them in the morning. The transfer is never 100%. The donating canister almost always has at least a few grams of gas left behind. Such is life. NOTE: These photos were all taken indoors where the light is good. I typically refill outdoors where vapors cannot build up and there are no sources of ignition. That's it. That's how to refill canisters. Remember, no matter how you go about it, refilling is innately dangerous. Refill at your own risk. 1. Lower cost in the long run. 2. Custom filling. If I am going on a trip where I'll need 140g of gas, I fill my canister to 140g and stop. I do not need to carry a full 230g canister. Weight savings: 70g. 3. Topping off. Say I come back from a trip with a canister with only 25g left. Before I had a refiller, that gas would just sit on a shelf with no real value to me. 25g is too little to bother with. Now, I just top off the canister, and the canister is as useful to me as the day I bought it. 4. Reduced environmental impact. Reusing anything reduces one's overall impact on the environment. Yes, canisters can (and should!) be recycled, but recycling has environmental costs. Yes, recycling is better than the landfill, but there are transport, processing, re-manufacturing, and distribution costs associated with recycling. Yes of course I have the empty butane canister to deal with after refilling, but I'm primarily refilling the small 110g canisters from the larger 227g butane canisters. I'm therefore reducing the overall number of waste canisters. Ideally, I'd like to find an even bigger canister to refill from, but that opportunity has so far failed to materialize. 1. "Fiddle" factor. You have to spend some time to refill the canisters. Of course, any such fiddle is done in advance. There is zero extra fiddle out on the trail. I much prefer filling in advance over using an adapter out on the trail. 2. Butane is only good for warm weather use. 100% butane is only good so long as the fuel stays above about 40F/5C. If the fuel gets colder than 40F/5C, then your stove will have lackluster performance. I personally do the majority of my backpacking and hiking in warmer weather, so this is not an inconvenience to me. I have thought about doing this in the past, but for no other reason than the fact that it annoys me to have all that metal being used for a canister. And while I punch holes in mine after I use them (thank you jetboil for that nifty tool!) and I am able to recycle them, I often wonder if they actually do end up getting recycled. But if all I would be doing is moving fuel from one metal container to another metal container, I suppose it somewhat negates the whole plan of mine. The big danger in refilling disposable containers is moisture. Water entering the receiving container could cause corrosion of the relatively thin wall of the canister. It is easier to refill canisters when you put the receiving canister in the freezer for a while so that it gets cold. The donor canister is left at room temperature. When you mate the two, the donor fluid fills the empty canister rather quickly, due to the difference in vapor pressure between the two canisters. You still want to be careful about moisture, since you can get condensation on the cold canister. You can also do this by putting the receiving canister in a bucket of ice. The adapters are still listed, but the price has gone up to $53. Even at $53 it still seems to be very economical. Where do you buy the donor butane from at a good price? As to it being dangerous, show me something that inherently isn't, including backpacking itself. Unless of course, one does it correctly. Plans ahead, checks the weather, always carries the ten essentials etc. The point being that if done correctly, responsibly and intelligently, we can mitigate the danger to an acceptable level. As to the fiddle factor, looking forward to, and getting ready for a trip and the anticipation is part of the enjoyment. At least for me. But the two biggest advantages I see are the potential cost savings, and perhaps most importantly, actually always being able to start a trip with a full can, and not having to worry about if I have enough left over in my many (sometimes) partial cans. That is the very reason why I usually have hiked with just white gas, simply because I can be sure of exactly how much I have at any one time. Even despite it’s drawbacks of always having to prime, possibility of spills while transferring fuel , fussing with a pump etc. It never even occurred to me that this was possible. I think this is great. This has really inspired me!! Thanks for pointing out this idea Jim, You write a great blog!! Yes, moisture is definitely a concern. I actually visually inspect the canister and valve before refilling. If it looks bad, it is bad, and it goes in the recycle bin. The rig that is currently on eBay is a slightly different set up than the one I got. The one currently on eBay also includes not just the refiller, but also an adapter that will allow one to hook appliances like the gas lantern shown to a cheap butane canister. The rig I purchased is less expensive. HOWEVER, the dollar to yen exchange rate has changed unfavorably if one is in the US. I'm sure that my cheaper rig is now more than $37.00. "The point being that if done correctly, responsibly and intelligently, we can mitigate the danger to an acceptable level." These butane canisters are available at restaurant supply stores. I imagine CostCo or WalMart may carry them, although I haven't checked. There's a Dollar Store near me that carries them for a dollar. Cheap! I also find them in grocery stores that cater to Asians. There's a Korean market near me that sells a four pack for $5.00. I've topped off a lot of partial canisters of isobutane/propane. As you say, it works, but sometimes I've had to chill the receiving canister. Also, as you say, one could transfer other mixes if one had a different adapter. Be very careful though. 100% butane is the safest to transfer. As soon as you start talking about other gases and mixes, the dangers increase. I'm not saying don't do it. Just be very careful. Mixes are tricky. You cannot predict the vapor pressure by simply knowing the relative percentages of the constituent gasses by weight. The formula and the mathematics are QUITE a bit more complex. My thinking on mixes had to do with topping off canisters with the same mix in each. After re-reading your post, I realized that you had covered this subject and I really wasn't adding anything to what you had already said. No problem. You've given me a lot of good feedback. And this was a pretty meaty post. On the subject of scary refill adapters, here's another interesting one at DealExtreme. This one seems to go from a standard "bbq-type" LPG cylinder to a Lindal valve. The reading up I have done indicates that, at least in Australia, propane is used to fill LPG cylinders of the type typically used for BBQs - it would then be a vary bad idea to top up a hiking canister that way! In reality, this adapter may be more interesting to cut down into parts. I want to add a bit about moisture. To get rid of the moisture in receiving canister simlply do the next steps before and after refilling. 1. Make sure you are in good ventilated area and there is no fire around. 2. Turn the canister upside down. 4. Open the valve of a canister just for a moment by pressing it with a cuted toothpcik. All the moister will be pushed out by gas pressure. Yes, that is scary. It appears to mate with a large propane tank. 100% propane. Put that into a thin-skinned backpacking canister, and you could have a very serious problem. It would be like having a bomb in your backpack. NOT GOOD. Now that's a very interesting idea about purging moisture. I'll have to experiment with that. I have experimented a little with refilling, and learned by reading and experience. The overfilling hazard may be the main reason to not make this legal in all states. Leave approx 20% of the volume for expansion. The lindal valve may leak if dirt enters, don't refill a container if its not "good as new" Pure propane has to high pressure, and may make it to a bomb. The valve contains rubber-like seal, and it may be brittle, so even old, unused canisters may leak after first use. Use your oldest canisters first, and refill to the the newest if they are with the valve you need. Good comments all. I so far haven't tried to refill with propane at all. With propane, the pressures -- and the risks -- are much higher. Good advice to use the older canisters first. Ah. Good diagram. And now it can be seen why I think filling with 100% butane is relatively safe. 100% butane has the lowest vapor pressure. This was extremely helpful, just what I was looking for—thanks! However I cannot find the refill adapter on ebay. Any suggestions? I saw the japanese website http://www.alva.ne.jp/ but it seems to be meant for locals. If all else fails I'll try to have friends from Japan acquire it for me. I have made my adapters from old stove parts. If one is handy, that is an excellent option. The ones from Japan are good, but they are expensive. There is a refiller available on eBay right now. This is the same refiller as I have except that this one is a set and includes the additional piece that will allow it to be used as not only a refiller but also an adapter. Oh thanks HJ, somehow my eBay search didn't find that earlier, I really appreciate it. It works OK, especially if I freeze the receiving canister first. Wondering if one is replacing a butane/propane mix with pure butane, can one (theoretically) safely overfill since the pressure is lower? Could you, for example, put 120g of butane in a Jetboil 100g canister without exceeding its pressure rating? I am locate din Puerto Rico right now where isobutane camping canisters are very hard to get, but butane cartridges are $1 at the grocery store. I would definitely NOT overfill. It's not just a matter of the vapor pressure of the gas (100% butane vs. propane/butane), but also a matter of volume. If the canister does not have sufficient vapor space (in other words the interior of the canister is taken up by liquid), then the pressures could be very high indeed. I would be EXTREMELY diligent about not overfilling. A couple of grams won't matter, but significant overfilling could be really dangerous. Overall, I think you're a smart man for refilling with plain butane in Puerto Rico. I doubt the temperatures in PR necessitate the use of propane/butane or propane/isobutane mixes. in my country malaysia we are using 14kg tank for domestic use. anyone has any idea using it as donor tank? There are two issues here. First, what's in the 14kg tank. If it's "LPG" or propane do NOT use it to refill portable canisters. Portable canisters like those used for backpacking cannot withstand the pressures involved with LPG or propane. If on the other hand the 14kg tank has butane in it, then you should be fine, provided that you can find a safe method of transfer. That's where the second issue arises: What kind of connector does your 14kg tank have? You have to find a safe way to connect the 14kg tank to a 100g (or 220g or 450g) portable canister. Downside is, it has no mountings and you need to push down/hold it all the time. This is even cheaper, saves you the hassle of refilling and also converts your stove to a remote can stove. You'll blow your eye out, kid! That first one should work. You might lose some gas during the process, but it should be all right if you do it outdoors and away from any heat sources. The second one is a good idea, although I don't know about the quality of the particular item at that link. Kovea has one that is very good quality. It's a bit much to carry for a serious backpacking trip, but for shorter trips, day trips, car camping, etc. they'd be fine. That last one is down right dangerous and should be avoided. See Canister Refiller WARNING. BTW, a little OT, did you see the stoves that DX has available? They've got a couple interesting ones. Cheap ones for $8. Remote-inverted canister stoves with vaporizing tube for $16. A Pocket Rocket clone for $12. And multi fuel stoves for $50. I have seen some of the really inexpensive stoves. You might be OK with gas although I'd be afraid of traveling to remote area and relying on a cheapie "no name" stove. I definitely would not want to try pressurized liquid fuel. That just seems too dangerous to me, and I've heard/read too many reports of problems with cheap Chinese liquid fuel stoves. Jim; First off, Thank you for an A+ site. I have learned alot from you. Regarding canister refills; I see you stop short of using propane in the mix, no doubt for safety reasons. I live in Michigan and rely on my Windpro II with the canister inverted during winter months. Is there concern in adding 15% (by maximum fuel weight) of propane to the butane refill? I've heard 30% propane is about the safe limit for these thin-walled canisters. Secondly, how many degrees would I gain by adding 15% propane? In other words, is it worth bothering considering the increased pressure/danger? Butane is always going to be safer than propane because butane has so much lower vapor pressure. However, I think refilling with propane is reasonable if you're a) really careful and b) you use relatively new canisters in good condition. For propane refilling up to 30% by weight, I would only use canisters that originally came with an 80/20 isobutane/propane mix or a 70/30 regular butane/propane mix. Those two mixes have about the same vapor pressure. If you refill those canisters with a 70/30 regular butane/propane mix, you will never exceed what the canister was designed for, and with reasonable care and canisters in good condition, you will probably be OK. There's always some risk when working with explosive, flammable gasses, a risk that you must be aware of and decide whether or not to bear. Now, that said, could you go beyond 30% propane? In order to meet EN417 standards, canisters must be strong enough to not deform at 50C (122F). If you keep the canister colder than 50C, you have more of a margin for error. Significantly colder = significantly safer (in terms of internal pressure). If, as in winter, you kept the canister consistently below 0C, you could fill with mixes with more than 30% propane. Would those mixes be safe? Only if you kept them cold. Would it be worth it? Well, the more propane content, the better cold weather operation you'll get, but it's also true the more propane content, the greater the risk. You'd have to decide if it's worth it. The other trick, rather than "overfilling" (going beyond 30%) with propane is to warm the canister. With a stove with a wonderful flexible fuel hose like the Windpro II, you can maneuver the canister so that it is close enough to pick up heat from the flame. THIS IS VERY DANGEROUS, but if you frequently and diligently check the temperature of the canister with your bare hand, you mitigate the risk somewhat. If the canister feels hot, take IMMEDIATE action to cool the canister. Particularly with a stove like the WindPro II that can run with the canister upside down, this technique of warming the canister with the heat of the flame is very effective. Try googeling : propane butane mix temp pressure and look for pictures. You will find a graphical temperature pressure diagram telling more than words. That's an excellent diagram. Now, notice something. The pressure, whether measured in bar or psig, is about the same between 50/50 propane/n-butane as 30/70 propane/butane PROVIDED THAT the 50/50 mix is kept about 20 Fahrenheit or 10 Celcius degrees colder. In other words, a 50/50 mix at 10C has about the same pressure as a 30/70 mix at 20C. Given the above, one should be able to use mixes containing higher percentages of propane in cold weather. You MUST however keep the mixture cold. Don't forget and bring the mix into the house and set your backpack next to the fire. That would be bad, very bad. Love the site, and love the idea of refilling. on a larger 4.5kg propane tank. It takes P220 propane canisters which I find very wastefull, and expensive. I suppose I could refill the P220 canisters from a larger gas canister, but I wonder if there is a way that I can use the larger tank directly. The regulator is built into the heater and is connected with a copper pipe to the element. The heater in the link is a BUTANE heater. I think you'd do far better to get a PROPANE heater if you want to run it off a 4.5 kg propane tank. I'd switch to a different type of heater. I've found a cheaper way of doing it: a needle adaptor for inflating footballs with a bicycle pump works as well, if you cut the needle down to about 4mm, and make a small cut with a hacksaw to let the gas flow through the side of the needle. A couple of small o-rings to seal it all, and away you go. The disadvantage is that you have to hold the canisters together to let the gas flow but they could be clamped/strapped. Definitely needs to be done outside away from any sources of ignition as some leakage is inevitable. I just watched a Youtube video by 'clkindred' called 'Butane Tank Adapter'. Toward the end at 7:00 he spotlights an inexpensive airbrush adapter that fits the canisters and has a 1/4" standard pipe thread outlet, which would be great for connecting canisters to various sources. Also I just dug up one of those needle inflators and I'm off to see what I can do with that. I should add - i mean the ones that can stand without needing to be held. I haven't seen them lately either. They're still available if you want to order them on the web from Japan, but there is a language barrier there. Boy, would I ever be careful about refilling with propane. That could get dicey in a hurry unless you really know what you're doing and are very very careful. My guess are: safety: the bottles and valves are not designed to cope with such high pressure as propane gives. When we do refill we cut one safety line, how many are you willing to stress or cut? A mix with a small amount of propane will be OK, but how do you know whats right? I want say you should not do it, but think, consider the risks, ask someone to see if you have forgotten anything before you test it, be careful, take care of you selves, and those around you. Best have a look. @turloker, the lightweight OEM canisters do use propane in percentages that average around 30% in their winter mix blends.In fact, the demonstration referenced above often references the safe procedures originally prescribed by Roger Caffin (EG: using a scale). Caffin's, (arguably the world's leading expert on this subject) information is an invaluable pre-requisite study for anyone pursuing this, and some of his graphs are real eye openers. We've been doing our own canisters for inverted liquid feed method since last fall with a 30-35% propane blend, approximately the same amount that is used in the OEM canisters. The scale, and some math, allow you to get it right. The coldest we have used that mix at was -25C, and the stove worked well inverted with no issues. As HJ noted you really need to know what you're doing, in my case I do, but indeed it may not be a pursuit for all. For me, it not about saving money. Taking inspiration from the practices of Canadian Petroleum refiners who formulate seasonal gas and diesel blends, I like the ability to tailor my blend to the time of year, for example, using straight butane in the warm summer months, a 15-20% blend spring and fall, and 30-35% when it's the dead of winter when it commonly can get to -30C in our neck of the woods. It sounds like you've done your homework, particularly if you've studied Roger Caffin's pressure-temperature curves. Most canisters in the US *should* be able to hold a 70/30 butane/propane mix without any trouble. I say this because many canisters Coleman, Jetboil, MSR, etc come with mixes that when new will have roughly the same pressure as a 70/30 mix. Of course if the can or valve were deteriorated in any fashion, you could have a problem. I'm also assuming here that you're refilling with butane not isobutane. How much "further" could one go with increasing the propane content above 30%? Well, if one were diligent (don't bring your pack inside and put it by the fire forgetting that there is an "augmented" canister in there! ), you might be able to go quite a bit higher -- BUT that is a guess and assumes you're keeping the canister reasonably cold, say no more than 40F/5C. Unfortunately, my math skills have atrophied to the point where I can't make the calculations any longer. Roger Caffin or someone like him might be give you a reliable figure. Tom, it looks like you have everything in, but it is important to make people aware of the risks. Some people takes tings to easy, and sometimes they have bad luck. Yes, I appreciate what you're saying. I think that most of the resources I've referred to, just like this Blog does, stresses those risks (as well as the procedures required to mitigate them). I think perhaps the reason I can do this is I have the luxury of a Back Yard, and an outdoor garden shed where I can store my canisters without the need to have them inside. (My 35-40% fills never see an heated enclosure as they even go to the trail head in the ski pod, and they are all gone by the time spring rolls around). Perhaps the one limitation that needs to be stressed more is that this hobby is not one that people who live in apartments or condo's have the resources to undertake. I should also note I have been using this winter mix in my butane lighters with good results. However I just noticed a new video in the Mountain Parameters Youtube channel about using USB lighters to light camping stoves and I'm thinking I'll explore that method as my primary ignition source from now on. USB lighters. That sounds interesting. I'll have to look into that. So you've successfully gone as high as 40% propane by weight? Very interesting. VERY interesting. Have you ever used the PowerMax Canisters from Coleman? Those were sold in many markets (not the US) with a 60/40 butane/propane mix. If you kept them cold, perhaps you could use them with a 50/50 mix which would be a REALLY good winter gas. While I have not done that, I suspect that you could go 50/50 in the dead of winter if you observe the typical protocols and perhaps a few other habits such as perhaps only reusing a canister at that level once or twice to avoid the weak valve problem you note. I realized that I was also filling my lighters with that 60/40 mix, and they are kept inside. In fact I also had been pre freezing the lighters prior to refill on occasion to max the fill. In spite of that, non of the lighters have leaked any gas (I think I'll be using USB lighters for stoves from now on anyway, but will still need butane for relighting hand warmers). I realize that is a pretty subjective observation because a lighter in no way resembles a gas canister, but it is an observation none the less. As I've gotten older however, I tend to stay home more when it's much colder than -20C, and if it's a quick day trip at those temps, I'm not real keen to stand around waiting for a brew anyway, so perhaps I wouldn't really need a 50/50 blend. I haven't seen those canisters. At work in the summer I have access to thousands of discarded canisters in the National Park Campgrounds. Most of them are the green propane, and maybe 5% are Butane, with most of those being the medium to large, so I find I dig aggressively to find the smallest size, which is a luxury that those of us that refill have. I'm a little leery of putting high propane content fuel into lighters designed for 100% butane, but it seems to be working. The dimensions of a lighter may be stronger than I would have thought. Smaller dimensioned objects tend to be intrinsically strong. A 50/50 mix. Now that is a WINTER blend. I'm working on custom refilling for the silver side laying Coleman PowerMax canisters (the best canister format developed but now sadly discontinued. Will report more in a month or two. Bret, yeah the high end adapters are a bit pricey. You can do some re-filling with sort of make shift adapters, but you have to be careful. Check out You Tube. There are a lot of examples out there. Propane is more dangerous, but I refill small JetBoil canisters with 100% propane for winter use, and I never had any troubles. Just don't fill to the top. Wow! You are a brave person. If you keep them cold, you will increase your margin of safety, but personally, I would not go with 100% propane in a normal backpacking canister. I go to a 40% mix in winter in the 235ml MSR IsoPro canisters. This summer I forgot I still had one packed away. When I pulled it out, I noticed it had formed a 'bump' in the base: there was a golf ball size protrusion that had formed in the concave base due to the increased pressure when it got warm out. It was encouraging to note the lindal valve did not leak, and the canister did not explode or vent, however it does not take much imagination to think if that canister had 100% propane the outcome would have been different. I consider a 40% propane mix to be something that is used only when it is -20C or less, otherwise I go with correspondingly less propane when it is warmer. Honestly I don't see any difference between 20% mix and 100% propane. 20% of propane in the mix will develop exactly the same pressure with 100% propane at any given temperature. In case there is enough volume for evaporated 'gas' fraction, the pressure is the same for 10% and 80% filled canister. Last summer I used 100% propane-filled small MSR IsoPro canisters during my backpack trip in Glacier National Park with outside temperatures around 85F, and I never had any troubles at all. Just be careful and do not overfill. Liquid propane fraction should not exceed approx. 75% of canister volume. Think of a baloon. Every breath exerts the same pressure into it. With each new breath, the baloon expands to accomadate it. Now think of Butane as being the equivalent of one breath, and propane the equivalent of 10. Eventually when the baloon can expand no more, it bursts. If one breath of propane is the equivalent of ten of butane, you're going to get a lot less propane in before it explodes. Now think of that butane canister that was designed to hold a given amount of butane, and then pressurize it 10x more, which would be the equivalent when filling it full of propane. The evulsion in the bottom of our canister was not some figment of my imagination, and the causal agent was pretty easy to identify given the canisters providence: I would not have been comfortable going on that hike with you, I hope no family's with children were sharing your picnic table at the campsite. Hikin' Jim - Tremendously helpful post and website (and YT videos - I have my eye on a Kovea spider in large part due to your reviews). I've refilled a handful of iso blend canisters with straight butane (they all worked great last summer) and it's been fun to experiment on my back deck during winter months (15 degrees last night). You can actually see the difference in performance between straight butane and the winter blends. Also, I was able to see a difference between my jetboil flash and the newer Sumo which has an expansion chamber of sorts. Anyway, I'm taking a scout group on a winter snow cave camp out this weekend and I was wondering about making a "home brew" butane propane blend for the colder weather. Despite being in sub-zero temps, I would never consider straight propane or even a 50/50 mix (that's just me though), but I would definitely consider using the same mix the canister was filled with initially. I am risk averse but I do reload (firearms ammunition) and so I am definitely one to exercise extreme caution when needed and to pay attention to the details. I have a nice scale and wanted to read up here before I attempted it. My question is about adapters. I have my eye on some G-Works brand adapters. I've heard the lindal/lpg adapter works more universally with stoves than the Kovea brand. Both seem solid. Also, have you had any experience with the G Works Gas Saver? It's basically a valve with two lindal type adapters on each side. They advertise it as a tool to get the last bit of one canister into another. I thought this would be a good method to control the propane when adding the propane to the home brew blend. Your thoughts? The adapter is sold by "Taiwan Camping" store on their webpage here: http://store.taiwancamping.net/home/outdoor-gears. Scroll down the page and you'll find it listed as "GAS REFILL ADAPTOR" for only $8.50. Cheers! Thanks for the awesome information on this page by the way! This makes me feel better about refilling the canisters with butane (and NOT propane). YEs they do appear to be a bit on the pricey side. THe disadvantage is not being able to weigh while filling. After searching for quite a while I think I've found an adapter that looks promising on ebay. Just search fro "g works gas saver". They look pretty pro in the pictures, I'm about to order one form here http://r.ebay.com/tYdAnE which seems to have the best price that I could find. I guess it was bound to happen. The Koreans spent time and effort to develop a good piece of quality kit, and then the Chinese copy it. It just got my Chinese copy of this adapter and although it is not the same quality, it gets the job done for $7.00. However, I still prefer to use a flexible line so I can watch my weight ratios on a scale while I'm refilling, so this adapter will only be used to scavenge left-over gas from my other orphaned 211G butane containers. I will still be using a flexible line and scale to measure my winter mix propane/butane refills. Been over 4 years since my first post here, thanks for keeping this blog going Jim! Hi Jim. I've been using the Soto Americus and really like it so far. I also have a Sidewinder Ti/Tri which I also enjoy. I was thinking of bringing esbit as a backup for the Americus to allow me to use up my partially filled canisters. The stove's burner cup could hold the esbit. My concern is that the esbit would gum up the stove. Is this concern valid? If so, i could line the cup with foil. What do you think? Very useful information for people planning for outdoor campaigns and picnics with their friends. Get butane gas refill and make the outdoor visit comfortable. This information is quite useful who are all looking for refilling their canister with gas.